Many patients who have pain in the hip will immediately claim “I have sciatica!” Often this is not the case. This blog entry will help you differentiate between hip pain and true sciatica. The sciatic nerve is made up of the peripheral nerves L4, L5, S1, S2 and S3. Somewhere near the buttocks these 5 nerves combine into one “hose” of nerves and we call this bundle the Sciatic Nerve. The sciatic nerve then weaves its way through the muscles of the back of the hip (buttocks region) in order to run down the leg. 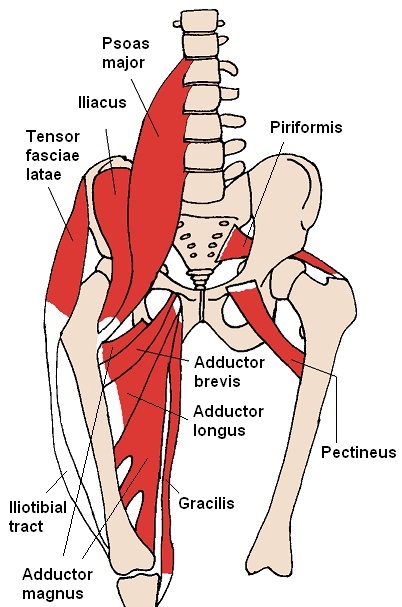 One of the big muscles that can put pressure on the sciatic is the piriformis muscle. 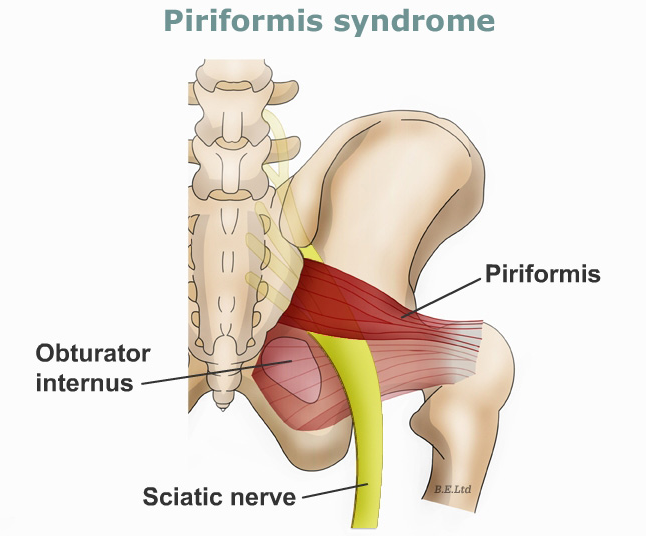 Although any muscle can irritate the sciatic, it is typically the piriformis. This is why pressure on the sciatic nerve is sometimes confused with piriformis syndrome, a condition in which the piriformis is injured or strained and emits posterior hip pain but does not necessarily impact the sciatic nerve. 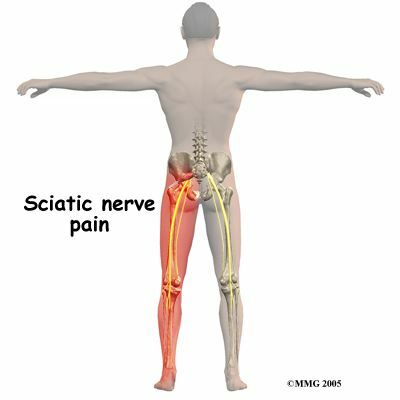 Buttocks or hip pain without pain going down below the knee region is not sciatica. 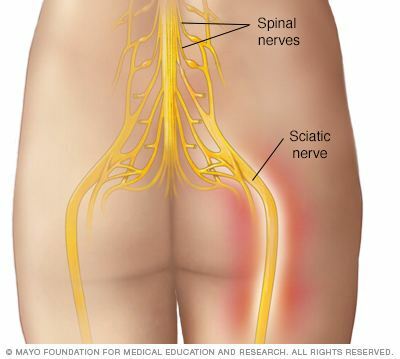 Interestingly, the sciatic nerve often has two branches before combining into a single branch below the buttock and one or both of these branches can run over, under or through the pififormis muscle. Either way a tight piriformis will pressure the sciatic nerve and cause symptoms all the way down the leg because that is exactly where all these nerves end up. A single nerve — such as L4 — only “feels” a small section of skin sensation down your leg, so if you are pinching the L4 nerve, only the stripe of skin innervated by L4 will be numb, in pain or give a burning sensation. But because the sciatic nerve contains several nerves combined into one large bundle, the skin region affected by sciatic nerve pressure covers larger areas of skin (sometimes most areas) than a single nerve would. So, often, most of the leg is affected and undergoes changes in region and sensation. So, if you can check off the following, you may be suffering from sciatica. 3. teach you proper lifting/sitting ergonomics to keep the hip muscles from tightening up again. 4. prescribe home exercises and therapies to keep the hip muscles from re-aggravating the sciatic nerve. Women are more likely than men to develop hip pain. This is due to the width of their pelvis. Because they have wide pelvises (for child bearing) but their feet come down exactly in the same spot as men on the ground, their thigh bones are at a steeper angle. 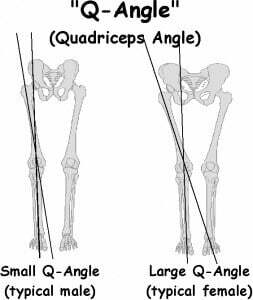 The angle of the thigh bone (femur) in relation to the hip socket is known as the “Q Angle.” The larger this angle, the more strain on the muscles that cover this region. So you can see why more strain is applied to the hips of women than those of their male counterparts. As women age, if they gain weight and lose muscle tone, the effects on the hip soft tissue increases in the negative direction. 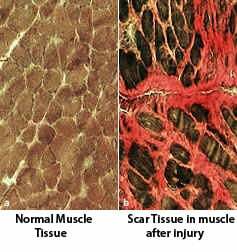 Loss of muscular strength, endurance and size places more strain on the passive tissues such as ligaments and joint capsule and even tendons. Placing more continuous strain on these. Add excess weight and you compound the problem. Muscles of the hip are therefore under more strain because they are weaker than they used to be, so they can accumulate micro damage and the inevitable formation of scar tissue. 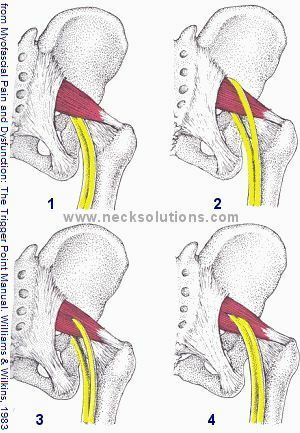 There is a 2 part approach to solving hip problems in women when they are the result of the above scenario. 1. Soft Tissue Treatments. Sports massage techniques are effective at breaking down the scar tissue that has formed throughout the hip region. This is an unpleasant but effective procedure. It also helps flush out inflammation naturally. 2. Exercise prescription. By performing safe and specific hip and core exercises, the muscle tone of the hip region increases, taking the strain off the other soft tissues and making the muscle itself more resilient to stress and strain. 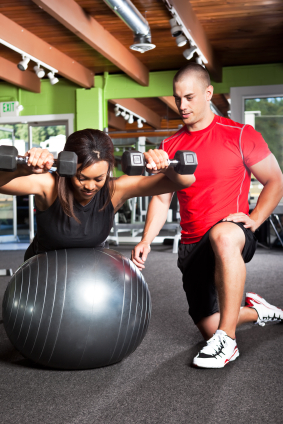 Increased muscle strength also increases pain thresholds and decreases inflammation. 3. Flexibility training. The greater your range of motion, the more effectively the body spreads out the strain of movement and weight bearing, making the hip less likely to become injured. If there are weight loss issues to tackle, this should be done in conjunction with the above 3 point plan. 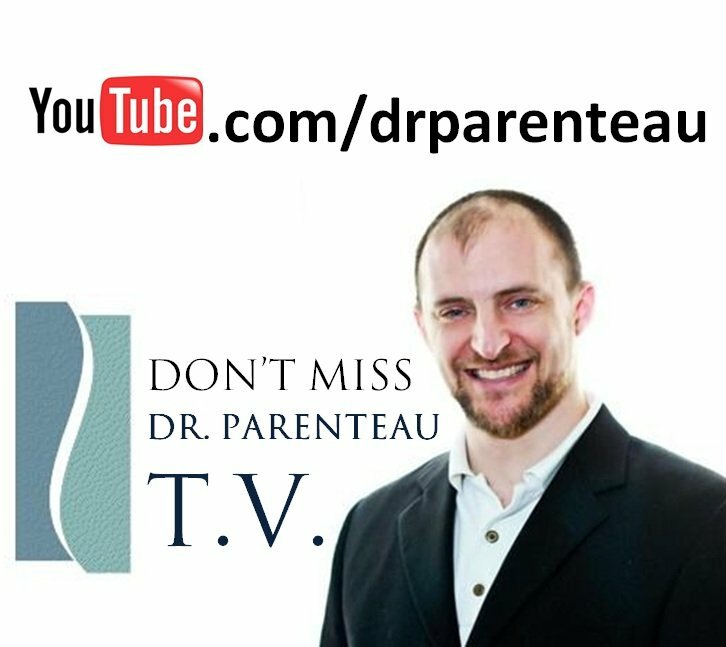 If you or someone you know suffers from chronic hip pain, link this article to them. Thank you!